Not many people are aware of the life changing messages in Communion with God. After taking this online course, you won't be one of them. This course takes that incredible book and breaks it down into amazing processes that can change your life. It includes: lessons, exercises, flash meditations, flash movies, and other interactive features. This is a "must course" for anyone interested in taking the messages of CWG to a deeper personal level. You are about to learn the meaning of Life. You are about to be given the key to the Universe. You will then be handed the tools with which to fashion the life for which you have always yearned: the life of your dreams. The world needs your Light now. Not tomorrow. Now. Naturally, you already know this. That's why you've found your way to this course. It will take you through a process of discovering Who You Are and living the Grandest Version of the Greatest Vision you ever had about yourself. In May 1995, an extraordinary event happened that would change the lives of millions of people. Book One of Conversations with God appeared with a simple message: Love is all there is. In this online companion to that book, we have prepared an actual study course that allows you to move more deeply into the material, to not only to understand and experience the concepts, but to embody and apply them in every moment of your life, to feel the concepts come alive in your body as your life becomes a living conversation with God. This may be just what you've been looking for ... The CWG Library of Courses is a dynamic and very accessible way to bring the timeless messages of Conversations with God into your home. 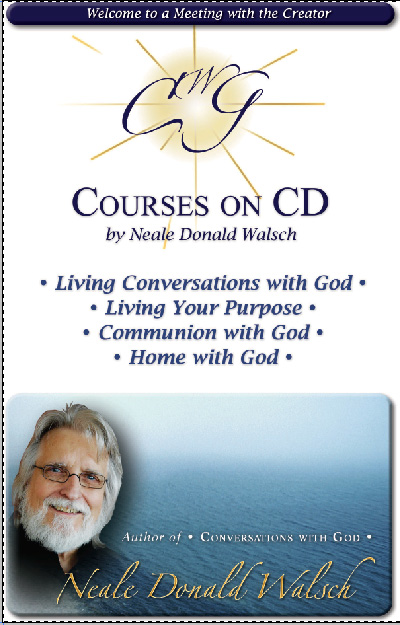 This special full set includes Living Your Purpose, Communion with God, Living Conversations with God, Home with God, and the recently released Changing Change Course. The wonderful people at Wisdom CD have taken the "Spiritual Nuggets" from the life-changing CWG material and presented them in a way that will engage and inspire you using state-of-the-art audio and video presentations. These five courses can be purchased individually, or in various combinations at a significant discount. Available as downloads or on CD, they represent a vast library of wisdom that will give you hours and hours of enjoyment and enlightenment.